Save money and make your own homemade peppermint mocha at home; it’s comes together quickly with the help of a peppermint simple syrup. 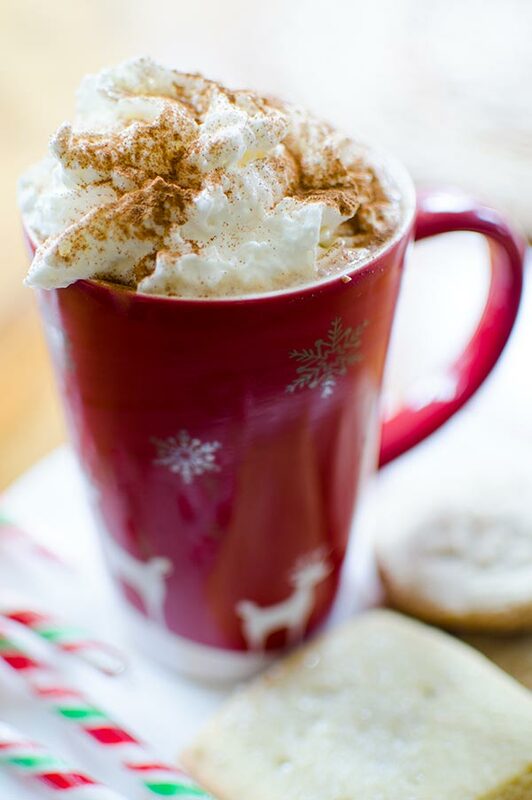 I’m not the kind of person who goes crazy for specialty holiday coffees, but even I have to admit that around Christmas I do like to indulge in a homemade peppermint mocha here and there. Homemade because they are just better than buying them from the local coffee shop and also much cheaper. It’s a win-win situation, don’t you think? 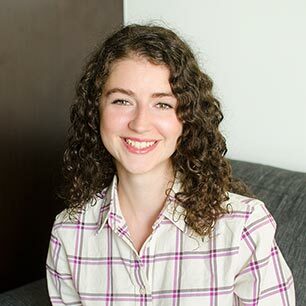 If you’ve been reading for a while, you’ll know that I’m the kind of person who likes to drink my coffee just straight-up; an endless pot of steaming black coffee on a Saturday or Sunday morning is what dreams are made of. 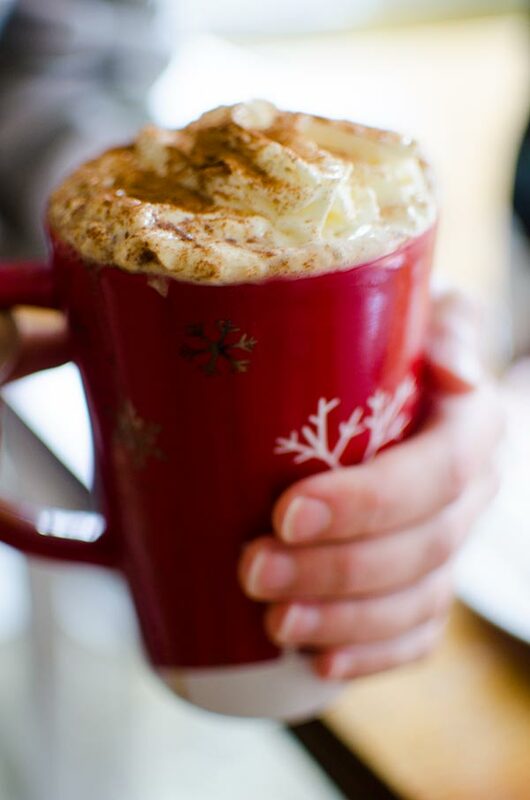 I’ve been getting into the holiday spirit all December long on here, sharing Christmas cookies and decadent holiday desserts but I think if you’re waking up on Christmas morning, a round of homemade peppermint mochas is clearly the best (and only) way to start your day and spread holiday cheer. You get that hit of caffeine, some festive flavours from the peppermint simple syrup and a little chocolate because well, we all need a little chocolate from time to time. 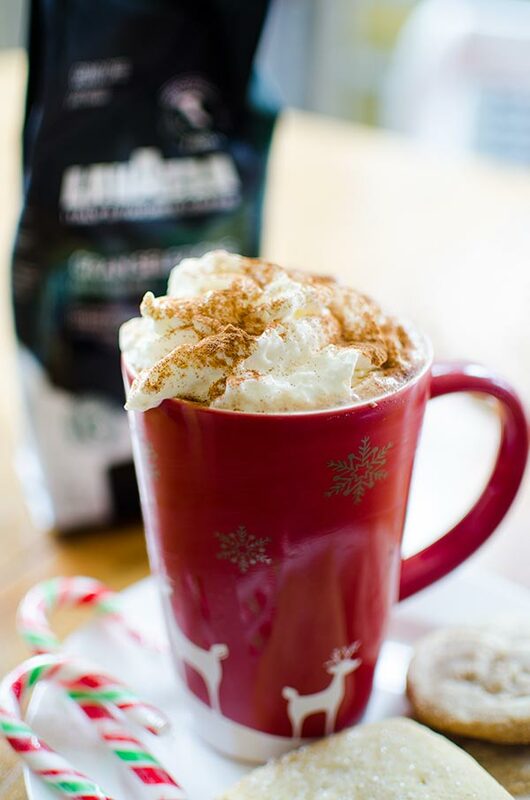 For this peppermint mocha I used Lavazza’s Gran Selezione blend which is a blend that I love and have used before to made another delicious mocha drink (this time, it was summer-inspired). This coffee blend has an intense flavour with chocolate undertones making it the perfect choice to enhance the flavours of a homemade peppermint mocha. This recipe comes together in three steps. The first step is to make a peppermint simple syrup, which is a combination of water, sugar and peppermint extract which is boiled together to create a deliciously sweet and pepperminty syrup. This is where the peppermint flavour for the drink comes – I love to make different flavoured simple syrups for all sorts of drinks. I’ve found that I don’t like to add straight peppermint extract to a drink without cooking it down a bit first because the flavour can be a little too abrasive that way. The next step is the chocolate portion of the drink which happens when you slowly melt a tiny bit of a semisweet chocolate in milk. Finally, you add a touch of the simple syrup, with the chocolate and milk and a hefty dose of strong-brewed coffee or espresso. I like to brew my Gran Selezione as espresso for this drink, but if you don’t have an espresso machine, a strong batch of coffee will do just fine. In a small saucepan, whisk water and sugar. Bring to a boil, whisking frequently until sugar dissolves. Reduce heat to low, add the peppermint extract and simmer for 15-20 minutes until syrupy and bubbly, stirring occasionally. In a small saucepan, heat milk over medium-high heat. Add chocolate, whisking to melt. In a large mug, add espresso, then 2 tsp of the peppermint simple syrup. Stir to combine. Top with hot milk and chocolate. Add whipped cream and sprinkle with cinnamon if desired. Disclosure: This post was sponsored by Lavazza– as always, all opinions are my own. Thank you for supporting my sponsors and allowing me to continue creating content like this recipe for a homemade peppermint mocha! I think I have everything I need to make this. My middle school daughters will go nuts! So festive - thanks and a happy new year to you LivingLou!